Is your idea of fun creating evolving soundscapes and textures? If so – you gotta check out Dronar Hybrid Module by Gothic Instruments. Dronar sure looks good on paper and I’m happy to say it delivers the goods! It sounds exactly how you would expect it to sound… strange and unusual with lots of surprises. I mean that in a good way. Dronar is basically a 1 finger drone machine capable of delivering evolving thick layered soundscapes and textures that could be the backdrop for any number of projects. It does pads too, but Dronar is less musical than it is an experimental dream machine. If that’s what you’re looking for, I think you’re going to love Dronar. Now – I have to admit – the fact that Dronar is mainly a 1 finger at a time machine can get in the way of creativity in my opinion. Not a huge thing, but I might be more comfortable if it were slightly more musical. But that said I do realize that isn’t the point of Dronar. DRONAR creates complex atmospheres from a very small number of notes played (1 to 4 recommended). It spreads out the chord in the mid-range, adds a root bass note, a high note and then adds evolving sound effects. 8 simultaneous different sounds are then animated with LFOs and arpeggiators to bring them to life. The result is rich and dramatic. Dronar is expressive. It really can deliver a wide range of sounds. But while the controls for the 4 layers are cool in concept, I think I might prefer a few more sound sculpting options in addition to mixing the levels of the layers and adding movement and intensity. 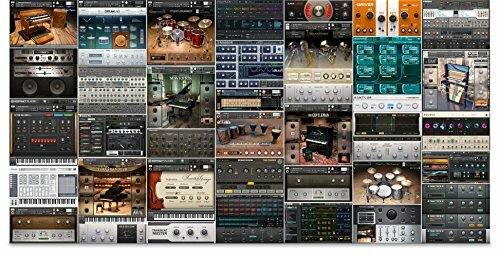 But from what I can tell Dronar is not intended to be your typical sound library where you tweak and create your own patches. I think it’s intended to be more of an expression laboratory where you take what you have and make it move. That’s not to say the other tabs won’t allow you to tweak the presets, but in general the main tab is where you do most of the layer mixing – so that’s where a few more sound sculpting options would come in handy. I know – I am nitpicking. It’s great at what it does. Make drones. I guess you could say that the beauty of Dronar’s main interface is that it is easy to assign to some knobs and play it the way they suggest – which is to use one hand for holding down the keys and the other for twisting the knobs or moving the mouse. Also of note is the performance factor. Dronar presets can take a while to load and sometimes I heard crackling and such as the cpu maxed out and went above 100% That’s because the samples are long, around 20 sec. each and there are many of them layered in each preset. Some more than others. If you’re just holding down 1 key forever it’s not an issue, but if you jump around the keyboard it was for me and might be for you. If you have a monster of a computer it might not even be an issue. But if you occasionally have problems maxing out your system, it’s likely Dronar will do that too on occasion. All in all I would say I like Dronar a lot. It’s fun to play with. It seems to have a never ending supply of presets to explore and it does sound great! As I mentioned before – if you’re into drones and textures and soundscapes you will dig Dronar. It will keep you busy! And at around 70 bucks it won’t put too large of a dent in your wallet! Dronar is available at the Time + Space website.